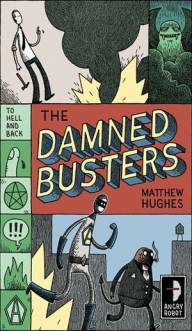 Matthew Hughes is one of Canada’s best SF writers, and by far the funniest. In this, his latest romp, he tries his hand at that venerable subgenre, the ‘deal with the devil’. deal on some technicality; or (3) the tricked-by-the-devil morality tale in which the too-clever protagonist discovers that his fool-proof deal (say, asking for immortality) doesn’t pan out as anticipated (because if you forget to specify ‘staying young’, living forever while continuing to age turns out to be its own equivalent of Hell.) That pretty much covers the range of where one can go with this genre...unless, of course, you’re Matthew Hughes. Hughes is one of those out-of-the box thinkers whose slightly off kilter vision always produces a unique take on things. Here, Hughes’ clueless protagonist accidentally raises a demon, but then simply refuses to make a deal because, well, why should he? And in Hughes’ exceedingly logical, if slightly twisted universe, this refusal precipitates a major crisis within Hell’s bureaucracy, the upshot of which is that Hell goes on strike. Without the motivation of temptation, civilization as we know it grinds to a halt. The only way to resolve the crisis is for the Devil to offer our hero his heart’s desire, but this time without the usual payment plan. That would make a clever enough story, but Hughes is just getting warned up. As it happens, our hero’s one secret wish is to be a superhero crime-fighter, just like in his favourite comic books; and Hughes is off again, this time skewering Batman-style justice. (Our hero learns, for example, that capturing the crooks isn’t all that helpful if you can’t prove probable cause when you broke into their drug lab.) It is the interplay between the superhero motif and ‘the devil is in the details’ deal story that makes the novel such an intriguing thought experiment. What raises Hughes’ absurdist humour above the ordinary, however, is that in spite of the inventive plot and satirical theology, this remains a character-driven novel. Following the story through the eyes of our slightly naive hero, each tiny step in each development is perfectly consistent with the motivations of the various characters, and therefore oddly credible. It is only as the cumulative effect leads to some completely logical -- though entirely unanticipated -- implication, that the reader is left collapsed in laughter, wincing at our hero’s latest predicament. Whereas in his previous books, Hughes’ droll humor was largely carried through the dialog -- as his characters engaged in witty banter or made ironically revealing pronouncements -- here Hughes allows his characters to take themselves completely seriously, so that we can too. Instead, it is the wry observations of the omnipresent narrator that reveal the fundamental absurdities of life and leave the reader cringing. Hughes particular brand of understated satire skewers everyone and everything in it is path, but with such style and grace that there is this kind of old world charm to the whole enterprise. It is a bit like watching an episode of The Simpsons as written by P.D. Wodehouse. comparisons to Jack Vance, Dorothy Parker, and Stephen M. Potter. The truth is, Matthew Hughes is incomparable, a national treasure, and highly recommended.